Welcome to the Spiritual Life page of The King's Academy. In all areas of school life here at TKA, we seek to bring glory to God. Each student is challenged to understand "who they are in Christ" and how to answer God's call on their life. Our prayer is that each child will learn to seek God first and to integrate the truth of the Word of God in order to impact their culture for Christ. "May Christ be formed in each child" and hearts come fully alive in Christ! The King's Academy uses Scripture as the foundation for all chapels. Chapels are a time of commitment to worship and to the Scripture for spiritual and personal growth. This is where the students are taught to understand that they have a purpose and a destiny in God and also how to live a lifestyle that brings God honor. Chapels are held once a week for TKA students and students are required to attend as part of their Bible class. They are led by TKA staff or visiting pastors, missionaries, and other speakers. The MS/HS worship is student led. There is a table talk with students and teachers. The purpose of the chapels is for worship and spiritual challenge. Students are always encouraged to worship as they are comfortable. Elementary Chapels' curriculum is The Gospel Project. Parents are welcome and encouraged to attend chapels. TKA's goal is to nurture all students spiritually as they grow to understand and apply Biblical truths within their own lives while establishing a personal relationship with Jesus Christ. Bible helps set the course of the day at TKA. Our Bible curriculum covers the Old Testament and the New Testament. Each grade incorporates Bible as part of the curriculum. In keeping with Scripture that teaches us to hide God's Word in our hearts that we might not sin against Him, Scripture memorization is an important aspect of the training at TKA. Parents are encouraged to review the Scripture with their child. The King's Academy uses Scripture as the foundation for all Bible classes. The students develop a Christian worldview. National Day of Prayer- The first Thursday of May the student body of TKA joins our nation in a time of prayer for the nation. 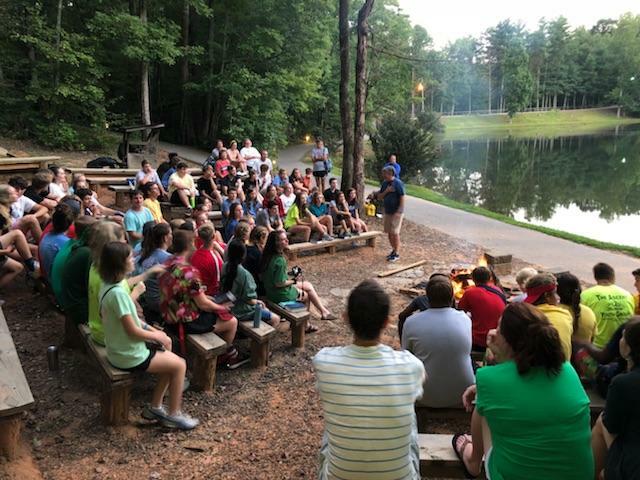 High School Retreat- The retreat is held at the beginning of each school year with the purpose of enriching relationships with God and with each other. There are class competition and chapels with a theme for the year. Thanksgiving Celebration - An all-school feast and worship before we break for Thanksgiving. See You at the Pole! - A national prayer service where students, faculty/staff, and parents gather at our flagpole to pray for our nation. Parking Lot Mission - Students gather needed clothes, blankets, and toiletries for the homeless community in Florence. One Saturday each quarter our students go to a designated site in Florence and distribute the items they have collected. Click the links below to view this year's scriptures. Students attending TKA come from over 50 different local churches. The staff represents over 30 different churches. If a question that reflects a denominational difference arises, the staff will answer the question in line with the literal interpretation of the Scripture and then encourage the student to talk to their parent or pastor.